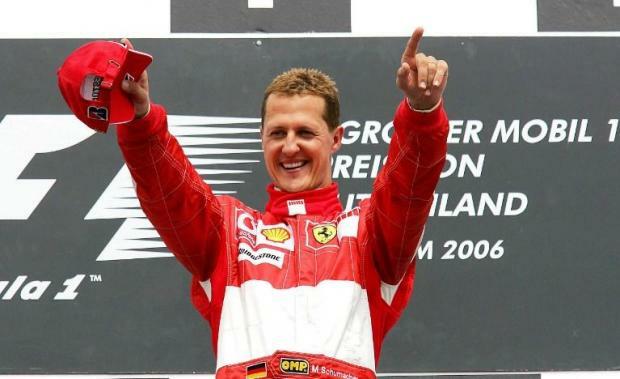 Ferrari issued an emotional message on Thursday to mark the 50th birthday of Michael Schumacher, who has not been seen in public since he suffered head injuries in a skiing accident five years ago. The German, who won a record seven Formula One drivers' championships and 91 Grands Prix, collected five consecutive titles with the Italian team from 2000 to 2004. Ferrari also won six constructors' titles while Schumacher was with them. "Our champ turns 50 today. We're all with you Michael #KeepFighting," Scuderia Ferrari tweeted. The official Formula 1 account tweeted: "We join the whole of the #F1 family in sending Michael @Schumacher our very best wishes on his 50th birthday #KeepFightingMichael #Michael50." The Ferrari Museum at Maranello in northern Italy is dedicating a special exhibition to Schumacher as a celebration of the team's most successful driver. F1 team Mercedes have hailed Schumacher as one of the "founding fathers" for their recent success. Schumacher came out of retirement in 2010 for a three-season spell with Mercedes before he was eventually replaced by Lewis Hamilton. Hamilton last year celebrated his fifth world championship, and his fourth racing for the Silver Arrows. "Michael is one of the founding fathers of the success we have had in the last five years," said Mercedes team principal Toto Wolff. "There is no other driver like him and his vast experience contributed tremendously in the development of our team." Hamilton is now the closest driver to matching Schumacher's records. The Briton is two championships and 18 race victories shy of the German's hauls. "Michael has had a tremendous impact on Formula One," added Wolff. "Not only did he set an incredible record -- a record that is yet to be beaten -- but he also shaped and changed the sport forever." Schumacher's medical condition has been held a closely guarded secret since he fell and hit his head while skiing on the French Alps in December, 2013. His family issued a statement on Facebook ahead of his birthday and have launched an app to celebrate his successes in the sport. "You can be sure that he is in the very best of hands and that we are doing everything humanly possible to help him," they said. Schumacher's daughter Gina also published a short message to her Instagram page, writing: "Happy Birthday to the best dad", accompanied with three pictures.